Long ago, we drank out of the nearest stream or lake. Even then, we understood at some level that drinking water was critical to our health. Fast forward to 1977, when we suddenly learned that bottled water was THE thing. A few years later we discovered that water needed to be flavored and enhanced to truly be healthy. What is going on? The bottled water business is amazing. Responsible for around 1% of the entire U.S. Gross Domestic Product, bottled water is no better for us than the tap water found in larger towns and cities. In fact, bottled water executives won't disparage their nearly-free competitor from the tap. 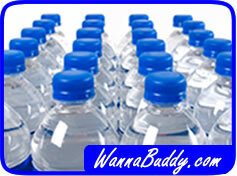 Bottled water has far more opportunity to introduce contaminants and bacteria than tap water. So why is bottled water such a success? Bottled water marketing departments will readily suggest that drinking bottled water helps you to keep track of how much water you're drinking every day. We all know the positive effects of drinking lots of water, so knowing your consumption is a good thing. Those pesky water glasses and refillable bottles are so confusing, aren't they? A lot of people also find that bottled water tastes better. That usually means that the bottler has added some minerals for taste. Not something that they put on the front of the label. In most cases, the water in the bottle came from some big-city tap with a bit of filtering and aerating. Several popular and competing brands actually use the same source for their water. Wouldn't that be a fun exposé for Geraldo Rivera! The latest fad in the water business is "enhanced" water. Every major beverage company has their suite of brands, such as Fruit2O, Skinny Water, O-Water, Propel, SoBe Lifewater, VitaminWater, SmartWater and more. These waters are available in every color of the rainbow and nearly every taste in the supermarket. How does enhanced water help you? Some contain electrolytes. Electrolytes are chemicals in our bodies that are lost when we sweat. So replacing electrolytes is good, right? It turns out that unless your heavy exertion lasts more than an hour, your body will replenish your electrolytes naturally without any help from your pretty water. Other waters contain vitamins and minerals. Others contain herbs and flowers to help you concentrate or fall asleep. Still others contain caffeine or taurine for energy and alertness. 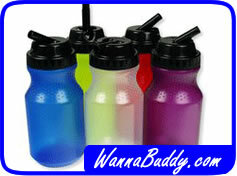 They all come in lovely bottles and have a variety of colors to match your wardrobe. Is there a down side? Beside the cost, which is not negligible, the benefit of enhanced water is hard to measure. The additives are typically in very small doses, making medical support difficult to obtain. The other issue to consider is the caloric cost of these beverages. Rarely discussed in the promotional literature, many of these drinks have nearly as many calories as a can of Pepsi. The waters that promote energy and alertness contain as much caffeine as a small Starbucks. So keep in mind everything that you're drinking when you reach for your beverage. And don't forget that recent research has shown that low-fat chocolate milk is actually superior when it comes to recovery from exercise. What is there to do? How about some healthy, free tap water in a reusable (BPA-free) water bottle!